Michigan's Heritage Park at Hilt's Landing in Whitehall, Michigan is a 230 acre site of the Muskegon Lakeshore Museum Center, exploring 10,000 years of history along a natural woodland trail. 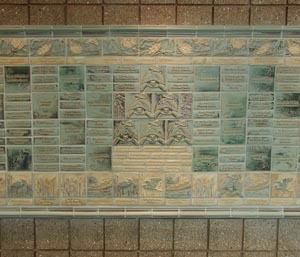 The tile map/mural in the visitor center recognizes the generous donations that made this park possible. Various interactive exhibits are illustrated on the donor wall, such as an Ottawa Village, a fur trader log cabin, a Civil War camp, a dig for mastodon bones, and a logging shanty. Grand Rapids Public Schools Blandford School is a state-of-the-art LEED certified school building that will be used by students and the community at large. 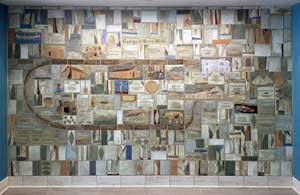 The new school is the first public school in Grand Rapids built primarily with private donations, which included the tile mural shown here. Mary Kuilema worked with 60 sixth-graders during their spring term to create tiles for the 8' x 12' mural depicting various plants and animals that are part of the school's natural setting. The design forms a spiraling universe of the natural environment for the school. Featured on the lower right quadrant is Mary Jane Dockery, environmentalist and driving force behind the founding of the school, interacting with a sixth-grade student. Tile was also placed in the egg washing station. The Ludington Library in Mason County, Michigan, expanded to add a children's wing to their building, after a successful fundraising campaign. 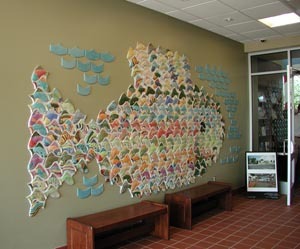 Donor recognition included naming of the wing, names on bricks in the floor and the fish tile mural in the lobby area, which included waves that had names impressed in them. A key feature of the mural was having children at the library paint the glaze colors on the tiles before they were fired to stoneware. 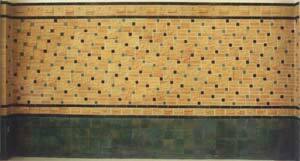 The tiles were then arranged into a large fish, installed and grouted behind a curtain. The unveiling was part of the dedication ceremony at completion of the project. The Caledonia Township Library was completed in February, 2011, with naming opportunities for various elements within the building, in addition to a large donor wall mural. More than 20 signs were placed throughout the facility with a common theme incorporating the natural flora and fauna of the setting of Caledonia, Michigan. Rooms and other specific library areas were designated with panels acknowledging gifts for those features. Fundraising was enhanced by the tile naming opportunity. 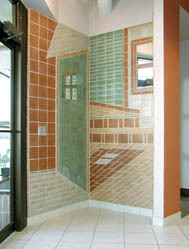 An interior 7' x 13' wall, of relief tile listing donors names was designed and built for Home Repair Services in Grand Rapids, Michigan. AMDG Architects renovated a 1950s style art-deco building into a resource center for low-income neighbors, lending tools, and providing training and materials for home repairs. Tiles depict a city street in the center of the wall, architectural renderings of the front entrance and "fix it" houses form the top border, while a row of tool tiles completes the lower border. fair opportunity for all for housing in West Michigan. with their newly remodelled offices. 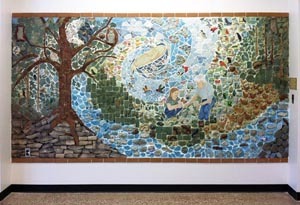 This border, of relief tile listing donor names was designed and installed at the Wittenbach/Wege Learning Center, an ecology & agri-science building used by K-12 students in the Lowell Area Schools. The tiles reflect the rural character of the district as well as the wildlife and native plants that thrive in this 80 acre preserve. An exterior 21' x 12' wall, of relief and flat (field) tile, designed for a Head Start playground at Grace Church in Grand Rapids, Michigan. Bugs, small animals, fish & flowers appeal to small children. Also in the mural are portraits of Head Start pupils and artwork done by Sunday School children. The centerpiece of the wall is a mosaic world of water, fish, leaves and flowers.